We offer Buffalo Omasum, which is extracted from healthy cattle. Highly nutritious, the Buffalo Omasum is offered by us after proper cleaning under very hygienic conditions. 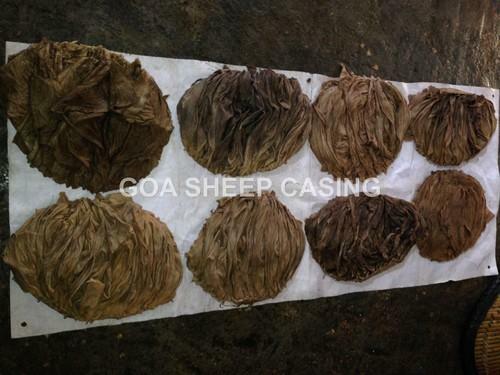 Incorporated in the year 1978, GOA SHEEP CASING CO is a prime name, engaged in offering Meat and Meat Products. The mentor of the company, Mr. Idris Khan has 35 years of experience in the field of casing and meat. With his immense experience in this field, we have scaled new heights in this domain carved a niche for ourselves. Our team comprises of experienced professionals, who have in-depth knowledge of this realm. Owing to their strict vigilance during the processing of the meat, we are able to bring forth a hygienically processed range of Meat Products to the clients. Moreover, the team is trained for the utilization of the machinery and ensures high production efficiency. We offer the clients with healthy range of Meat and Meat products. The products offered by us, are hygienically processed in our units and ensure quality and purity. Our range of raw meat products and bone products are tested on various parameters before supplying in the market.